In 1965, Irwin Allen gave the American television audience his greatest and most cherished creation, LOST IN SPACE. Mid-1960s Americans were confronted with the Cold War, Vietnam, racial unrest and political turmoil - but the escapist world of LOST IN SPACE treated viewers to monsters, ray guns, space battles and of course, the Robot. Colorful sets, creative scripts, and cliffhanger endings set LOST IN SPACE apart from other prime time fare. Of course, there cannot be a great science fiction show without great special effects...or a great space ship. Legendary special effects modelers L.B. Abbot and Howard Lydecker brought to life one of the greatest marvels of the science fiction world, the Jupiter 2. The Jupiter 2 offered here is the most complete of the four-foot filming miniatures; it was used in all three seasons, and known as a flying model. In the third year of the show it was modified to allow a small auxiliary spacecraft to be launched for planetary exploration. First shown in the Episode "Kidnapped in Space", the Space Pod would leave through a two-door hatch on the underside of the ship. Other episodes featuring this particular miniature's unique hatch opening are: "Hunter's Moon", "Flight into the Future", "Target Earth", "The Flaming Planet", "Junkyard in Space", and the legendary "The Great Vegetable Rebellion." This was the only Jupiter 2 to feature this function, and thus is the only miniature from the show that can be positively identified to specific "on-screen" usage! Of particular importance, this miniature features the only surviving "Fusion Core Atomic Engine", with dozens of original light bulbs which provided the spectacular display on the underside of the Jupiter 2. The ship itself is made of fiberglass and wood, and the Fusion Core is made of fiberglass with metal fins. The original interior flight computers are still intact, visible through the main view port, as well as the outline for the main hatch, the two opening doors for the Space Pod, and the lower level view port. The model retains its rough "forged steel" texture and color. With the conclusion of LOST IN SPACE, this model was used in Irwin Allen's City Beneath the Sea, being slightly modified with additional windows on the ship's hull to create a "city" effect. The Jupiter 2 was acquired directly from 20th Century Fox in the early 1970s by Academy Award-nominated model maker Greg Jein, who carefully restored it to its original LOST IN SPACE configuration. Along with the Jupiter 2 miniature, we are offering the original Launch Pad and Gantries from the pilot episode "No Place to Hide". (The spaceship used in the pilot was called the Gemini 12.) The Launch Pad and Gantries are crafted of various metals, with miniature spotlights and tank-style tracks. The Launch Pad features stairways and handrails, all to scale with the Gemini 12. The workmanship of these miniatures is beyond compare, created during an earlier era of special effects modeling, long before the advent of computer generated images. Created for the pilot, later use of these props from stock footage can be seen in the episode "The Time Merchant." This Jupiter 2, along with the Launch Pad and Gantries, have been displayed at many science fiction conventions and museums over the years. Both items are being offered for the first time at public auction, and are from the Legends of Entertainment Collection, formed by John J. Alcantar, III. Along with Star Trek's "USS Enterprise" and the "Death Star" from Star Wars, there are no better-known film or television spaceships than the Jupiter 2 from LOST IN SPACE. 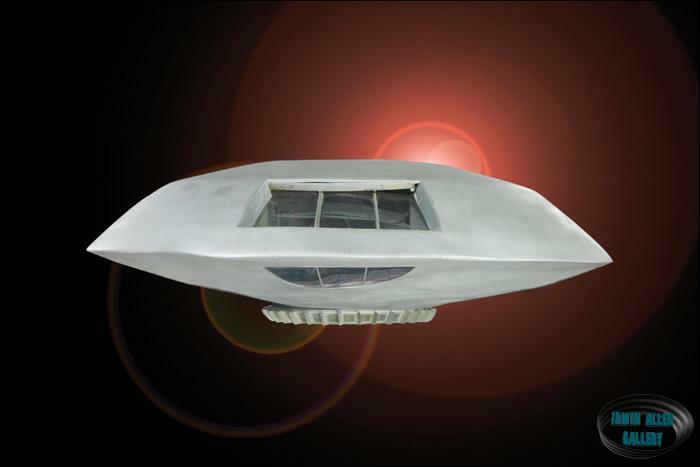 This is truly a once in a lifetime opportunity to own the very best spaceship from one of the very best classic television shows ever made!